Waiting to get your Dream Job? "Dream Job in 90 Days" is a story of young professionals in search of their dream jobs. This book is, however, more than just a story. It is also a “how-to” book. It is the ultimate "how-to-get-your-dream-job" book. If getting a great job is important for you, then buying this book will be the most important first step! By picking up this book, you will have started your journey towards success in professional life. You will soon find that this book may prove to be perhaps the most valuable investment of your life. If you are a fresher and are submitting your resume to jobsites for the first time and are just getting started, you will find the book extremely useful. Even if you have got years of work experience under your belt, have shifted multiple jobs in the past few years and are on all job sites, you will still need this book because despite your experience you may be making lots of common mistakes. If you think you are an expert at job hunting, then try and answer these questions: How many profiles do you have on a particular jobsite? Just one? No wonder you are losing out. Fewer than 5% of all professionals use multiple profiles on job sites. So if getting the next job is important for you, you can achieve a significant advantage by having more than one profile on a particular jobsite. Recruiters can be your No. 1 friend, especially in a competitive job market. Do you really understand how recruiters think and shortlist candidates? No? You are not alone! Most candidates don’t understand how recruiters think and manage the shortlisting process. This book gives you an insider’s view of how the recruitment process is carried on nowadays. Are you getting calls from recruiters based on your Linkedin profile? The book has a detailed chapter on LinkedIn. More and more recruiters are using LinkedIn to recruit candidates. So setting up your LinkedIn profile properly is more important than before. So are you ready to be challenged with new perspectives, new questions and new facts about the most important aspect of your work life? If making more money matters to you, then no book you've ever bought has more potential. This book will really help you in making more money by enabling you to get better jobs over the span of your professional life. 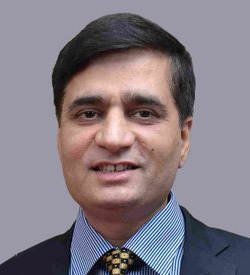 Abhijeet Virmani is an Engineer and MBA with almost two decades of work experience. Abhijeet completed his MBA from IIM Calcutta and went on to work for consulting giants Arthur Andersen and KPMG. For the past decade Abhijeet has been on an entrepreneurial journey and has incorporated multiple companies in the areas of consulting and professional training. Abhijeet's companies have assisted over 100,000 individuals in the last then years. He is deeply interested in education and careers of young professionals. Abhijeet has received wide media coverage in print and television. Anurag Mehra is an engineer from IIT Delhi; an MBA from FMS Delhi University; and ME from MIT, USA. Anurag has over twenty-five years of work experience in industry, consulting and entrepreneurship. Over the last ten years, he has been involved in various entrepreneurial ventures in consulting, training & education and recruitment technology & services. 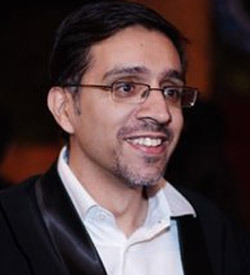 He was covered by the CNBC TV-18 program "Young Turks" in 2008. "A book that focuses on the strategy as well as nitty-gritty of job-hunting in this digital age. Unique and empowering. Must read for all young professionals and college students"
"Excellent advice for professionals on such an important theme. 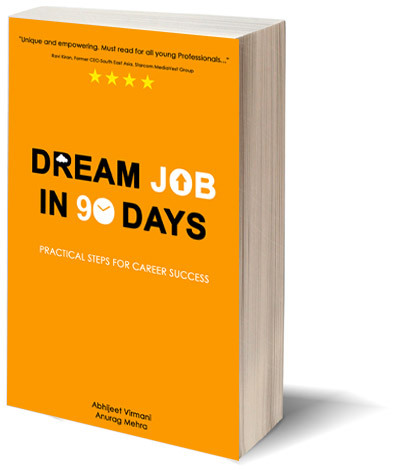 I will specially recommend it for students and young professionals"
"Dream Job in 90 Days is exhaustive in its content but also easy to read with an interesting story accompanying the great advice"
"Great insights into the job hunting process! I have never seen such advice anywhere so far. I will strongly recommend this book to all youngsters and even seasoned professionals in India." "I have known Anurag and Abhijeet for years. They have been educated in some of the best institutes of the world and have worked with CEOs of global corporations. In this book they put down all their learnings and experience for the benefit of others."